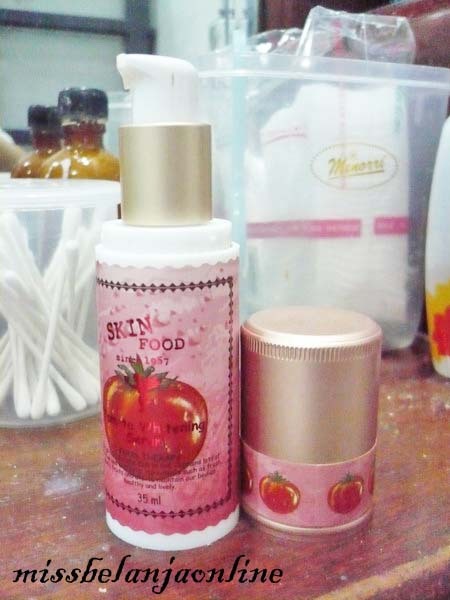 The skin food is one brand of Korean cosmetics and skin care that is quite famous in Indonesia. Carrying the name as "food for the skin", this cosmetic uses natural ingredients such as fruit and vegetables. No wonder every product has variants named fruit / vegetables. One of my favorite is the tomato variant. 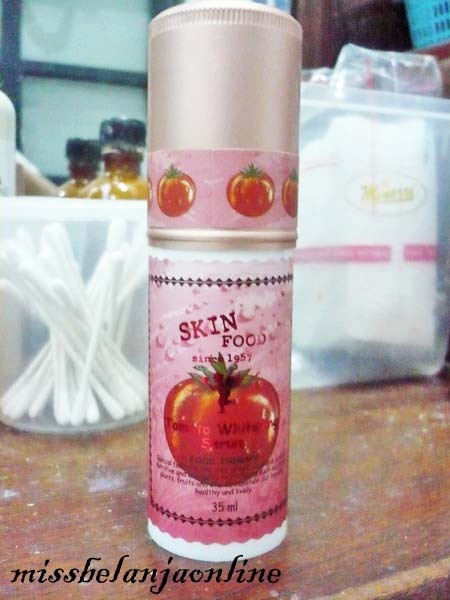 The skin food tomato whitening serum is useful to whiten the skin and facial blemishes. Before buying this product, I read many good reviews about this product. When I was on my highshool-collage days, my face have a problem with acne and that’s make me lose confident. After recommendation from a friend from multiply, I tried using this serum. From the website: This skin-brightening essence containing arbutin and tomato extract rich in lycopene, vitamins, and minerals makes dull skin clear and blemish-free and improves skin tone, without stickiness. Use: After lotion, apply gently onto face and cover face with hands, for deep absorption. The result is remarkable if you ask me. I wear it for a full month every night after cleansing. Within a month my face skin looks whiter and pimple marks fade to almost clean. Now I'm not using this serum again because I’m afraid that my face will look too white. So I give it to my mother. She has problem with black spots on her skin. she had been taking about 2 bottles and the results are quite good as black spots to be fading, though not perfectly clean. - Create a smooth finished surface of the face. If used before make-up, the end result is better make-up because my face is smooth and make my pores smaller. You can buy this product at The skin food’s counter. Or if you want a bargain prices you could try buying it online at Rie Butik (One of my favorite stores for selling cosmetics at bargain prices). I start to open your blogs n everything been so nice,, but can I consult something about this.. I read a review from another beauty blogs that said it was too greasy, so for oily skin like mine I need to choose either serum or the cream itself.. But since I think your skin type the same as mine and we live in the country so I just need recommendation for whitening product that can help my acne too? Have u tried the cream yet? If I need to choose one between the cream n serum, which one do u think fit me well? Thank you for coming to my blog. I haven’t tried the cream, I only use the serum and it works really good for my acne-prone skin. At first, I also confused like you, but I decided to bought the serum. Because I think the serum will works faster than the cream :p. It is a little greasy when you first apply it but after couple minutes it is absorb perfectly and not greasy at all. After use this serum, I use TBS blemish face night lotion for my night-skincare routine. Until now that combination still work perfect for me. If you still confused about what should you buy? You can try to buy the sample first, nowadays there are many online seller that sell samples. I hope I can help you with my answer. still thinking of buying the cream or emulsion.... any idea?